Last weekend, I was really honoured to be invited for a sponsored facial session with SkinLab located at Plaza Singapura. After assessing my skin condition, the therapist decided to let me try out their latest treatment, OxyGeneo™ NeoBright, a 3-in-1 super facial treatment that comes in 3 steps: Exfoliate + Infuse + Oxygenate. 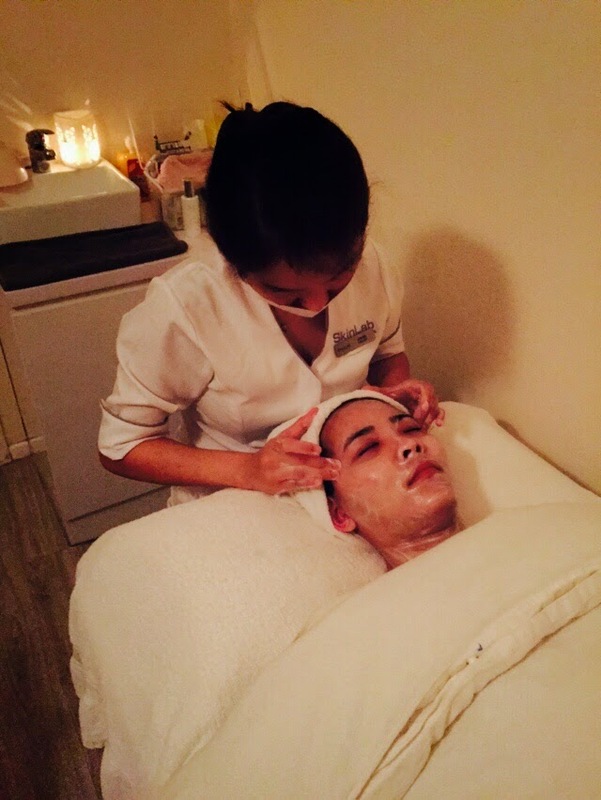 Touted as the new super facial, we can get the exfoliation benefits of microdermabrasion plus deep facial rejuvenation with the infusion of essential revitalizing nutrients and healing skin oxygenation from within. 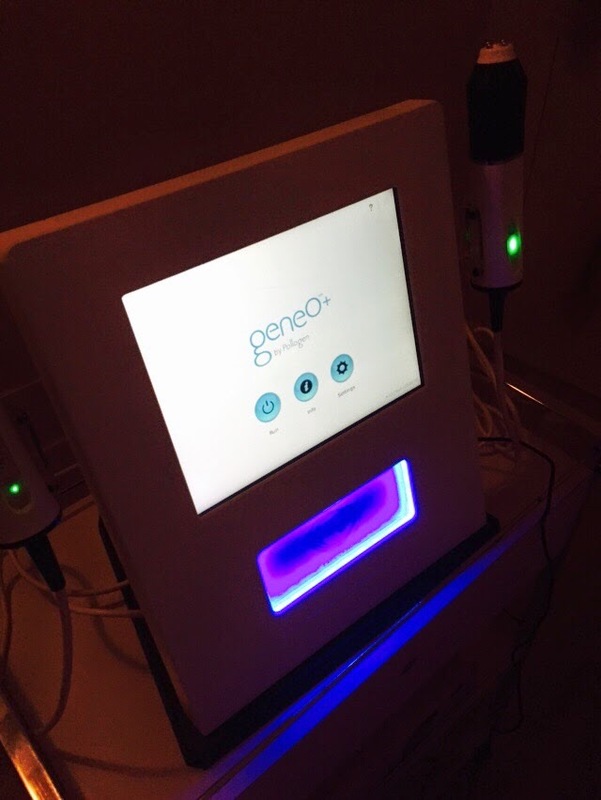 OxyGeneo™ treatments are suitable for all skin types – any ethnicity and pigmentation, sensitive skin, and even for those who keloid (scar) and couldn't otherwise have abrasion treatments. Through the exclusive Capsugen, the OxyGeneo™ cleanses the skin while infusing nutrient-rich active ingredients. There is two treatments available. NeoRevive™ for rejuvenation and anti-aging or NeoBright™ for skin brightening and texture improvement. NeoBright reduces skin pigmentation and sun damage while lightening the complexion. Azelaic Acid for even pigmentation, Kojic Acid for skin lightening, and Retinol for anti-aging. And so, after the short consultation, I was led to one of the rooms to change into my facial gown. The room was clean and simple, equipped with a large mirror and a bed with pretty comfortable comforter blanket. And that's the machine I got to try out for the day. And the therapist got the treatment started! I shall not bore you with all the different steps in the facial treatment, so let's get straight to what's important! As you can see, the results was amazing! I looked as though I was smirking with the right side of my face totally lifted while my left side remains saggy. And as the therapist also extended the treatment area down to my neck, my deep neckline has visibly lighten, although it wasn't captured in the picture. And that's my after facial look with absolutely no traces of make up on (and a pair of super geeky oversized glasses) and taken with my new samsung nx mini with no additional photoshopping. 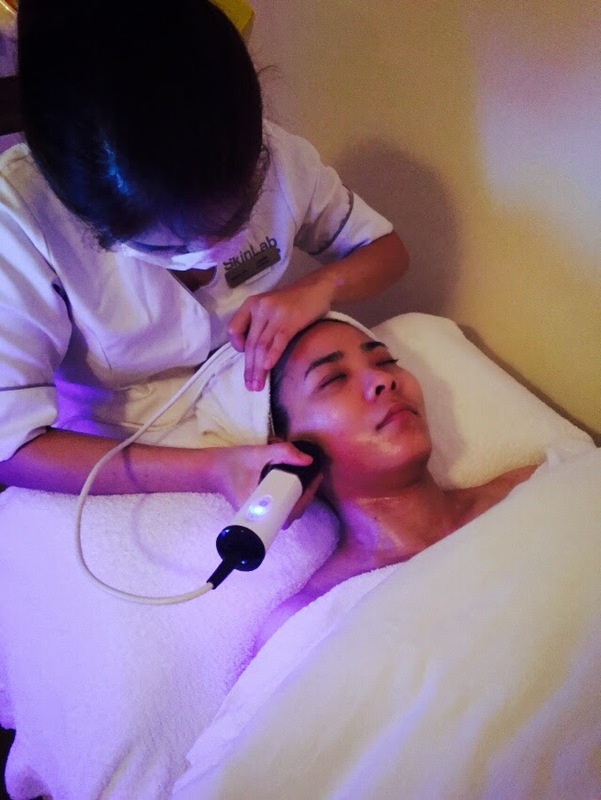 SkinLab offers treatment not only for face, but also for body, hair and contouring. Drop by SkinLab's website HERE to find out more! Hi mia, how does a treatment like that normally costs? the results seem really good. This seems like a good skin care service to get. You got me at exfoliate ( which I love ) + infuse + oxygenate. It takes facials to a different level and I would love to try this one. I like that it's good for any skin types. Upon reading your post, I need to see my dermatologist now for my monthly facial treatment. Oh I would love to go get me a facial right now. They did a great job on your face and it looks really amazing with the end result. so the pictures shows half side with a change? I don't really see a visible change! Perhaps you can circle out and show me which one! That half done face really showed the instant effectiveness of the treatment! I really thought you were smirking in that photo and was amazed after you explained what was happening. so lucky of you to avail that facial sessions. Its been a long while since I have a facial. Seems the facial gives a good result on you. Their facilities looks really advanced. It also worked well on you. Cosmetic Surgery just isn't like all common surgery. It needs more experience on the part of the surgical procedure to hold on beauty surgery. As the title suggests, it's involved with the beautification and correction of assorted body parts that leads to growing the appeal of the person going by means of this surgery. Your face is definitely glowing... They did an awesome job. Very relaxing and the result was lovely! You look beautiful! The facial looks scary but its effects are great. It is not for me though. skin pigmentation treatment marks are a serious problem that women around the world face. This is especially important in the Middle-East.